Long days snowed-in at home are the perfect time to take out one of the fun educational toys below. Whether kids are working with circuits or running their hands through sensory sand, these best-selling toys will keep them from getting cabin fever until the warm weather sets back in. Snap Circuits allow children to create electronic projects including AM and FM radios, digital voice recorders, burglar alarms, doorbells and more. All pieces are mounted on plastic modules and snap together with ease. This Pro version contains over 75 parts and an illustrated manual for building over 500 experiments. The set uses four AA batteries. — In late summer 2010, six of 43 retailers named Snap Circuits a science and nature best seller. — In a late Summer 2012 survey, four out of 12 retailers said that Elenco was one of their best selling Science & Nature toy brands. Chemistry Plus: The Alphabet of the Universe by SCIENCE WIZ / NORMAN & GLOBUS INC.
40 page science book with materials. An exciting set of selected experiments (Split water into rocket fuel! Pop hydrogen! Flame test salts! Grow huge crystals! Model 3D electron orbitals!) designed to make elements elementary and explore the periodicity of the periodic table. Learn about atoms and the stuff they are made of - protons, neutrons and electrons. This beautifully illustrated book takes children through the alphabet of the universe. — In a November 2014 survey, two retailers told TDmonthly that Science Wiz kits are one of their store's best-selling educational toys. Sands Alive! Deluxe Set by PLAY VISIONS INC.
Set includes 5 pounds of Sands Alive!, 6 Geometric Shape Molds, 4 Deluxe Castle Molds, 4 Small Castle Molds, 5 Mini Castle Topper Molds, 2 Sculpting Tools, 1 Paver, Brick and Pebble Rollers with Interchangeable Handle and Large Play Tray. — In a March 2014 survey, 2 out of 9 retailers told TDmonthly that Sands Alive! was a best-selling product. — Kelly Ratoff, owner of Kennebunk Toy Company in Kennebunk, Maine, told TDmonthly in a May 2014 survey that Play Visions sands are consistently best-sellers. "As many as we can get, we sell through," she said. — David Castillo, vice president of The Red Balloon Toy Store in Salt Lake City, Utah, told TDmonthly in a November 2014 survey that Sands Alive is one of their store's best-selling educational toys. "Sands Alive especially has been hard to keep on the shelf," he told us. 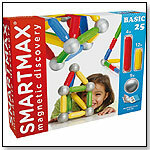 SmartMax Set - BASIC 25 allows children ages three and up to experience the wonders of magnetism and the fascinating world of construction in a safe way. Towers, bridges, and houses are just a few building options that take advantage of the large pieces to engage even the youngest builder. — Diane Gervais from Amato's Toy & Hobby in Middletown, Conn., told TDmonthly in a November 2014 survey that Smartmax sets are one of their store's best-selling educational toys. "Smartmax is pretty popular right now in preschool," she told us. Kids can recycle a soda can into a silly, walking, wobbling robot. The kit includes all the parts needed, right down to the googly eyes, except for the two AAA batteries that are required. Launch date: 2008. — “The Tin Can Robot is a huge hit. It’s from their Green Science series, which has been doing great,” Jennifer Schneeweis, owner of Izilla Toys in Seattle, told TDmonthly in late August 2009. Two of 40 retailers mentioned the brand when discussing best-selling educational items in fall 2009. ― “Right now we have the Tin Can Robot for 8- to 10-year-olds and that's doing well,” said Marlene, manager of Kits & Kaboodle in Carmel, Ind., when asked about her best-selling item for tween boys. Seven of 39 retailers surveyed in October 2009 said science kits are their top sellers for tween boys. ― “It's a good price point and an excellent product. It sells all the time,” Priscilla Moore, owner of Mr. Fub's Party, Toys and More in Yellow Springs, Ohio, said of the Tin Can Robot and other 4M science kits in spring 2010. — In August 2010, seven of 43 retailers told TDmonthly that Toysmith is a best-selling science and nature brand. Two retailers named Tin Can Robot as a top product. Grow dozens of dazzling crystals and conduct 15 illuminating experiments with this classic science kit. Experiment with four chemically different crystals each with different properties, including potassium alum crystals that form regular octahedrons, rapidly growing sodium sulfate crystals, long needle-shaped sodium acetate crystals, and plaster which is made from gypsum crystals. Mold fun plaster shapes and mix the dyes to grow a rainbow of custom colored crystals. Measure how the crystallization of solids out of a solution, and the dissolution of crystals back into solution, affect the temperature of the solution. Learn about the energy of crystallization. Investigate solutions, crystallization, and the chemistry of crystal growing. Learn about the structures and geometries of different crystal shapes. 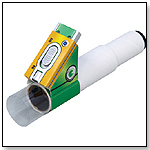 This kit is thoroughly tested and safe: Over one million units of this kit have sold worldwide. A full-color, 32-page experiment manual guides your experiments in crystal chemistry and Earth science. Launch date: Summer 2012. — Mary Porter Green, owner of Curiosity Zone in Ashburn, Va., told TDmonthly in a Fall 2012 survey that kits from Thames & Kosmos are one of their top-2 bestselling educational products. They sell dozens each month. — Mary Porter Green, owner of Curiosity Zone in Ashburn, Va., told TDmonthly in a March 2014 survey that crystal growing kits were a best-selling products. 40x magnification! The bright LED makes observation easy! You can even examine solid objects! — Paula Bolte, owner of Imaginations Toy & Furniture Co. in Blacksburg, Va., told TDmonthly in a November 2014 survey that Artec science kits are one of their store's best-selling educational toys. These reusable books introduce the alphabet, letters and first writing skills. Wipe-clean pages and pen offer lots of opportunities for practice. — In a Winter 2012 survey, Teresa Derry, owner of Annie's Toy Chest in Cocoa, Fla., told TDmonthly that they sell 20 of this item each month. — Mike Snyder, owner and manager of Cville's Hobbies, Games and Toys in Charlottesville, Va., told TDmonthly in a December 2013 survey that this is one of their best-selling books. — Teresa Derry, owner of Annie's Toy Chest in Cocoa, Fla., told TDmonthly in a November 2014 survey that Usborne books are a year-round best-seller in the educational category. Centered on basic math skills and beginning reading, this workbook includes activities with color illustrations that allow kids to practice for reaching first-grade goals while strengthening their critical thinking. — Seven of 40 specialty retailers referenced books or study guides of some sort when asked about best-selling educational toys and school supplies in fall 2009. — Annie’s Toy Chest in Cocoa, Fla., sells about 18 School Zone books per month. “Tourists grab them and use to keep the kids thinking on breaks,” Owner Teresa Derry told TDmonthly in late 2009.